Every time dada would go to Vrindavan, he couldn’t stop praising the khichdi that was served there,everyday to the devotees as breakfast. I use to think what is so special about the khichdi. Like other temples it must be just plain rice and moong khichdi. I realised the difference when Nunu started making a version of the khichdi at home either for lunch or dinner. Obviously she added a lot more variety of vegetables than the temple does. I took it a bit further and added onions and garlic to it to make it more tastier. Basically you can make it the way you want but it is definitely a filling dish. Great for post pregnancy, just recovering patients and a great comfort food on a cold rainy day. The khichdi should be a bit soft or dhili as we say in gujarati. I did eventually get to taste the khichdi when we went to Vrindavan. My version still does not taste anywhere near to the one in Vrindavan. That after all is prasadam and prasadam always tastes good. Mix the rice and lentils and wash thoroughly. Soak in 2 cups of water for 30 minutes. In the meantime get the vegetables ready. Heat oil or ghee in a deep pan. Add mustard, cumin and carom seeds. When they begin to splutter, add hing and immediately add the onions. Saute the onions till they are light pink in colour. Add garlic, ginger and chilli and saute for a further 30 seconds or so. Add turmeric powder and the vegetables except for the spinach or palak. Stir fry the vegetables for 2 minutes or so. Add the rice and lentil mixture with the water. Add salt and the remaining water. Cover the pan and cook over low heat till its done.Stir occasionally so that it does not stick to the bottom of the pan. The mixture will appear a bit gooey. Add the chopped spinach, mix and cover immediately. Let it stand for 5 minutes. Till will help the spinach to wilt. Add the garam masala or the remaining spice powders. Stir and serve. Vegetables that can be used are peas, diced carrots, potatoes, french beans, eggplant, doodhi (bottle gourd), turia (ridge gourd). Make sure you taste the ends of the turia before you chop it as some can be bitter.Can add any other vegetables of your choice. Can vary the proportion of the rice and lentil. Can use e.g. 1½ cups of lentils to ½ cup rice. Can make without onions and garlic and it still tastes great. Serve the khichdi with pickles, papad, papdi, yogurt, chaas, kadhi or with extra dollop of ghee. Add more water if required during cooking as the amount depends on how old the rice is and the heat you use. Can pressure cook it for 2 whistles. Such a healthy kichdi! 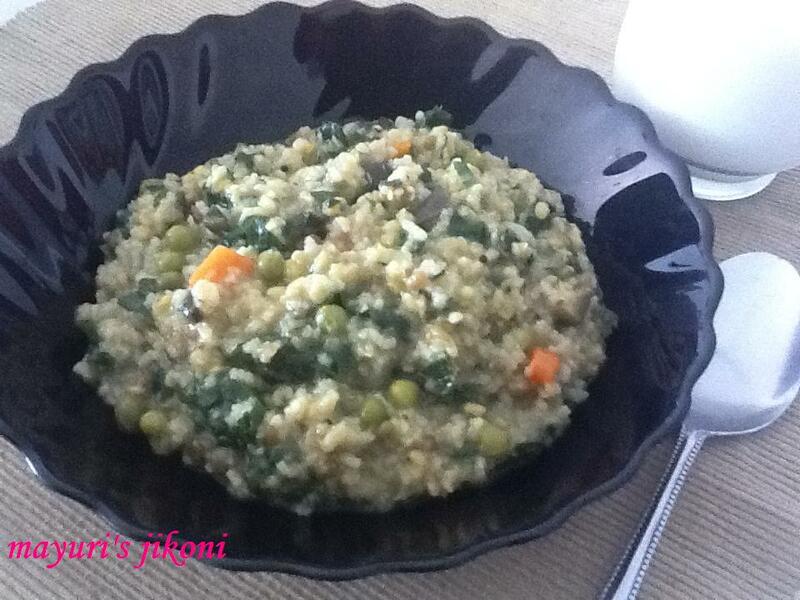 I love to serve kichdi to my kids for lunch since it is very nutritious. Thanks for linking it to my event.